Prepare for an unabashed, blue-sky blog-gush about last weekend’s Yorkfest Fine Arts Festival! In fact, if you can’t take the “isn’t York great” theme for a few hundred words, this may not be the post for you! From the vantage point of the York County History Center, this event is such a wonderful way to bring the area’s rich history to light while showcasing the phenomenal wealth of artisan talent that is here and throughout the region. It didn’t hurt, of course, that last weekend was a rare, cool-and-dry weather aberration for August in York, PA. The sky was blue, steaming coffee and hot food-truck food tasted its tastiest, and strolling along the Heritage Rail Trail with the Codorus Creek as a backdrop was sweetly pleasant. 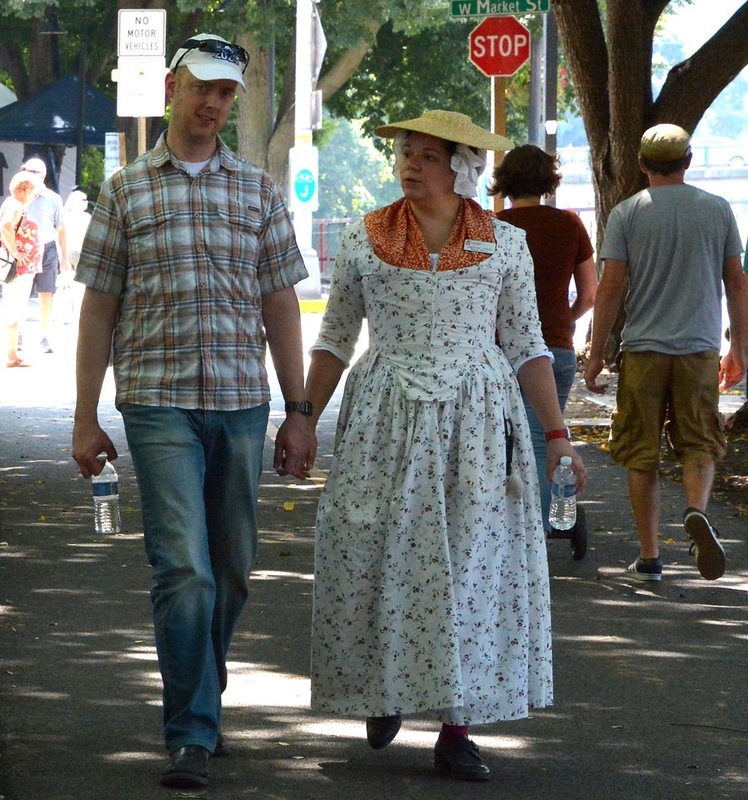 For Museum People, wearing historic garb in the humidity of summer in central PA can be a daunting prospect, but this time, it was amazingly fun to be authentic. Our interpretation staff does their very best work on days like this, where the community comes together and enjoys art and culture and the company of acquaintances and out-of-town visitors alike. Set in the heart of the festival, our Colonial Complex (the General Horatio Gates House and Golden Plough Tavern and the Colonial Court House) were open for tours, family activities, and photo ops, and the Agricultural & Industrial Museum, situated at the “end” of the festival trail, was the site of the CreativeYork Youth Arts Exhibit. It was yet another opportunity to underline the intersection of art and history, so impactful in so many ways. The History Center’s huge collection features many examples of fine art, often depicts moments in our county’s history. By the same token, the architecture of our historic sites, most notably the 1700s Gates House and Golden Plough Tavern, is fascinating in its diversity and the stories that it tells. Soon, the Colonial Complex will become even more central to our operations, as the “home base” of the History Center will move to the former Met-Ed Steam Plant just down the block (N. Pershing and W. Philadelphia). When the renovations are complete and the move is accomplished, this new “history campus” will facilitate an experience that is far more cohesive, allowing the visitor to park once and visit the main museum and the complex at their leisure. Just down the street will be shopping, dining, Central Market, and all of the amenities of a revitalized downtown York. But we digress. For now, let’s all just bask in the warm (but not humid) glow of a phenomenal Yorkfest Fine Arts Festival (orchestrated by the equally phenomenal #paradelady, Mary Yeaple). While we do, please enjoy these gorgeous photos by History Center friend and generous photographer Randy Flaum. What a partnership!